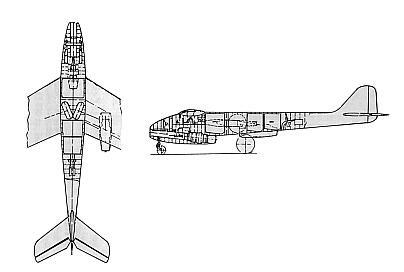 This Focke-Wulf design (also known as Design IV) for a twin-jet nightfighter also dates from March 19, 1945. The fuselage was to be constructed of Duraluminum, and the wooden wings contained a steel spar. Like the Design III, the wings were mounted mid-fuselage and were swept back 30 degrees. Three He S 011 turbojets provided the power, one was located beneath the cockpit in the forward fuselage and two were mounted under the wings. At least one engine could be shut down to increase endurance. A crew of three (pilot, radio operator and navigator) sat in a pressurized cockpit, with the pilot and navigator sitting side-by-side and the radio operator sitting behind them and facing to the rear. Armament was similar to that in the Design III, namely, two MK 108 30mm cannon in the fuselage nose and two MK 108 30mm cannon firing upwards in the rear fuselage, or four MK 108 30mm cannon firing forward in the fuselage nose. 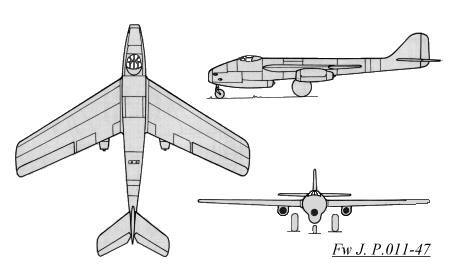 The influence that Focke-Wulf had with these night-fighter designs had a definite effect on Soviet aircraft manufacturers, with the Lavochkin La-200 and MIG I-320 in particular showing similarities to the earlier Focke-Wulf designs.